A woman carries jerrycans of water from a municipal water pipe off a main road at the outskirts of their illegal slum dwelling area called Chandmari Juggi in the Indian state of Uttar Pradesh. VIDEO:UN warns 2.1 billion people lack access to safe water. Good hygiene is one of the simplest and most effective ways to prevent the spread of diseases such as diarrhoea, cholera, dysentery, hepatitis A, and typhoid. However, findings in the report revealed that access to water and soap for handwashing varies immensely in the 70 countries with available data, from 15 per cent of the population in sub-Saharan Africa to 76 per cent in western Asia and northern Africa. These significant inequalities also put the implementation of the Sustainable Development Goals (SDGs), in particularGoal 6 on ensuring availability and sustainable management of water and sanitation for all at risk. According to the report, of the 2.1 billion people who do not have safely managed water, 844 million do not have even a basic drinking water service. This includes 263 million people who have to spend over 30 minutes per trip collecting water from sources outside the home, and 159 million who still drink untreated water from surface water sources, such as streams or lakes. “As we improve these services in the most disadvantaged communities and for the most disadvantaged children today, we give them a fairer chance at a better tomorrow,” said Mr. Lake. 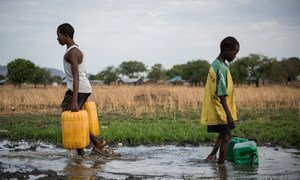 Access, funding and security are urgently needed to ensure humanitarians can reach hundreds of thousands of children suffering from cholera and diarrhoea across Yemen, South Sudan, Somalia and Sudan, the United Nations Children's Fund (UNICEF) has said.